Keith Farr concludes his analysis of the performance of 4-4-0 locomotives designed before the Grouping in 1923 which handled passenger trains with aplomb before the introduction of larger 4-6-0 and 4-6-2 types by the ‘Big Four’. The 4-4-0 steps slowly out from beneath the overall roof and, exhaust beats well-spaced and coupling rods ringing, accelerates past the loco depot before slowing for the sharp turn-out to the former Somerset & Dorset line at Bath Junction. The track, now single, turns sharply left to rise at 1-in-50 to Devonshire and Combe Down tunnels, the grade and curvature bringing the ‘2P’ and its green cargo down to a very low speed; but, beyond the two tunnels and on to Midford Viaduct, double track is regained and the tempo rises – a little. At Shoscombe and Single Hill Halt, we wait while a lady buys her ticket at the booking office up the slope; then, on to my immediate destination at Radstock to see one of the ‘Sentinel’ shunters serving nearby Tyning pit. This was my only run behind a ‘2P’ working solo; usually they were pilots, one of which, paired with a ‘Jubilee’, attained 77mph descending from Sharnbrook Summit on the Midland Main Line. Cecil J Allen even reported 86mph behind such a pairing, expressing his concern for the crew hanging on to the 4-4-0! Did the ‘2Ps’ really assist – or did they sometimes hinder rather than help? A word is necessary about their origins. Following the Johnson 4-4-0s, the final Midland Railway ‘2Ps’ appeared during the Deeley/Fowler period before the Grouping. 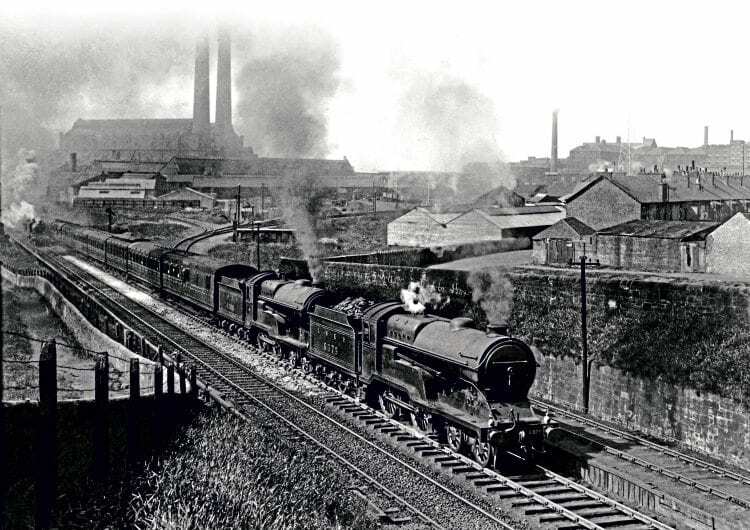 Many were then rebuilt and the later LMS standard version was based on them, with coupled wheels of 6ft 9in diameter instead of 7ft 0½in; however, they retained such Midland characteristics as inadequate axleboxes, short-travel valve gear and tortuous steam passages, such was the influence of the Derby faction in the 1920s. My June article concluded with a run behind a LNER ‘D16/3’, slowly accelerating along the level between Ely and Cambridge with a cross-country express. Now we move north, from the great skies of the Fens to the limestone hills and dry-stone walls of the Pennines, where we find a rebuilt Midland ‘2P’ battling with the long gradients of the Settle & Carlisle. Not only was No. 432 on its own with the admittedly light-weight 11.45am St Pancras-Edinburgh express, but it was booked non-stop from Leeds to Carlisle. The log (Table 1) first appeared in The Railway Magazine for February 1925 and the run was described by Cecil J Allen, although it is not clear whether he timed it himself. The load is quoted as 30 axles, perhaps six eight-wheelers and a 12-wheel restaurant car, weighing 193 tons tare against the 180-ton limit quoted by ‘CJA’ for a ‘2P’ on this service. Read more and view more images in the July issue of The RM – on sale now!